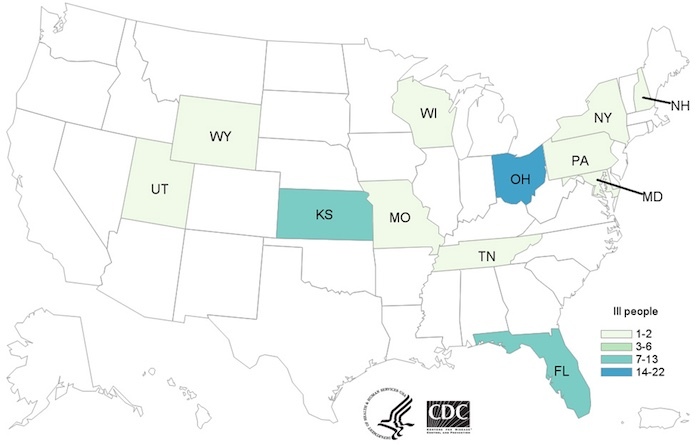 The Campylobacter outbreak linked to Petland pet stores puppies has grown. Now 55 people in 12 states have been sickened. No one has died, but 13 people have been hospitalized because their illness is so severe. Sixteen more ill persons have been reported to public health officials since September 1, 2017. The most recent illness began on September 12, 2017. The case count by state is: Florida (13), Kansas (7), Maryland (1), Missouri (2), New Hampshire (1), New York (1), Ohio (22), Pennsylvania (2), Tennessee (2), Utah (1), Wisconsin (2), and Wyoming (1). Fourteen of those sickened are Petland employees from five states. Thirty-five patients either recently purchased a puppy at Petland, visited a Petland, or visited or live in a home with a puppy sold by Petland before they got sick. Ill persons range in age from less than 1 year to 86 years. Epidemiologic and traceback evidence indicates that puppies sold through Petland stores are a likely source of this outbreak. Whole genome sequencing (WGS) showed that samples of Campylobacter bacteria isolated from the stool of puppies sold through Petland were closely related to Campylobacter samples from the stool of ill persons in multiple states. In addition, clinical samples from people and the puppies appear to be resistant to first-line antibiotics that are commonly prescribed. That means that these infections may not respond well to the oral antibiotics that are usually used to treat these infections. Analysis from 13 isolates showed that the bacteria is resistant to azithromycin, ciprofloxacin, clindamycin, erythromycin, nalidixic acid, and telithromycin. In addition, 9 isolates appear resistant to gentamicin, and 12 isolates appear resistant to tetracycline. NARMS performed traditional antibiotic resistance testing on one isolate from a patient. It showed resistance to the same antibiotic that analysis of WGS predicted. The bacteria is spread, in this case, through contact with dog feces. It does not usually spread person-to-person. Most Campylobacter infections are caused by contaminated food or beverages. It’s important to know that any puppies or dogs can carry Campylobacter and other pathogenic bacteria. Wash your hands well with soap and water after cleaning up after your dog, handling their food, or petting them. The symptoms of a Campylobacter infection include diarrhea that is often bloody, a fever, stomach cramps, nausea, and vomiting. Complications of this illness can include Guillain Barre Syndrome, which can cause paralysis. If you have been in contact with a Petland puppy and have experienced these symptoms, see your doctor.